Corey Galvin celebrates after scoring a goal. 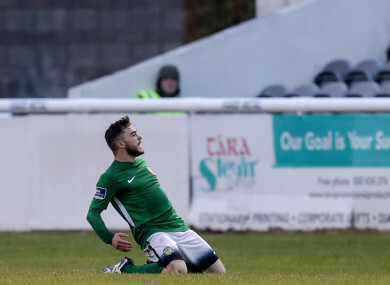 BRAY WANDERERS SPRANG another surprise at home as second-half goals from Cory Galvin, Darragh Gibbons and Daniel Kelly earned their third victory of the season. Galvin swept home after some ponderous play by Michael Leahy, right-back Gibbons roared forward from defence to finish off Gary McCabe’s pass and Kelly tapped home in the dying moments as the Seagulls closed the gap on Limerick to seven points despite Thomas Byrne’s late effort. A glorious chance came to nothing for the hosts in the first period as McCabe broke forward and waited for Daniel Kelly to scamper past him on the overlap before slipping him in. With options in the middle, Kelly went for glory but he blasted it into the side netting. Desmond intervened vitally on 40 minutes. McCabe threaded through for Pender, he couldn’t shoot and O’Conor’s attempt was drowned out too. It rolled back to Galvin who fired through a sea of bodies – including Murphy – but Desmond hacked it off the line. Wanderers started the second half with a spring in their step and they were rewarded in the 54th minute. Michael Leahy dallied on the ball and Pender stepped in to pick his pocket. Murphy raced from his line to block Pender but the ball fell to Galvin. Murphy charged towards him too but Galvin danced his way around the challenge and blasted it home. Bray’s second goal then came from an unlikely source. Darragh Gibbons took possession from Bermingham and laid it onto McCabe. He continued his run and wasn’t tracked so McCabe cushioned a pass into his path and the defender drilled it home past Barry Murphy. Pat’s pulled one back when Thomas Byrne rounded Moran after being found by Fagan but Bray had the last laugh as Daniel Kelly tapped home after Murphy had parried Galvin’s effort. Thomas Byrne was sent off in the closing stages. BRAY WANDERERS: Evan Moran; Darragh Gibbons (Calvin Rogers, 89), Sean Heaney, Conor Kenna, Kevin Lynch; Dan McKenna, Paul O’Conor; Daniel Kelly, Gary McCabe (Jake Kelly, 74), Cory Galvin; Ger Pender (Jake Ellis, 84). ST PATRICK’S ATHLETIC: Barry Murphy; Simon Madden, Michael Leahy, Lee Desmond, Ian Bermigham; Killian Brennan, Ryan Brennan; Conan Byrne (Michael Barker, 81), Graham Kelly (Darragh Markey, 48), Dean Clarke (Christy Fagan, 66); Thomas Byrne. Email “Second-half flourish sees Bray stun off-form Saints ”. Feedback on “Second-half flourish sees Bray stun off-form Saints ”.